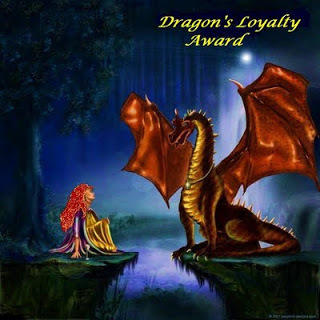 Mike over at Mike’s Film Talk, Meera over at Meera Darji, and Robbin over at Robbin’s Realm (check them out, they’re great blogs) have nominated me for the Dragon’s Loyalty Award. Special thanks to them. Here are the rules for accepting the award. Okay, here’s seven cool facts about myself. 1. I’m currently reading Lynch on Lynch and it’s a very fascinating book. I’ll post a review when I’m finished with it. 2. While I wasn’t directly scared by Night of the Living Dead, the thought of it gave me nightmares as a child. 3. I’m not a fan of musicals except for a few like The Wizard of Oz or South Park: Bigger, Longer, and Uncut (both of which have almost nothing in common). 4. The Simpsons is my all-time favorite TV show. I once dressed up as Homer for Halloween. 5. While I am a fan of F. W. Murnau, I fell asleep during Faust. 6. One of my biggest regrets is missing the Jaws revival in theaters last year. 7. I’m really fascinated with history. Since many blogs I follow have already been nominated and I’m not sure who hasn’t, if you want a nomination just post a comment below and I’ll give you the award. « What Do You Think of Terrence Malick? Glad to see you’re enjoying Lynch on Lynch. It’s certainly a great read! Thanks! I saw it at a bookstore the other day and had to buy it. It’s a great book. I don’t like musicals either….lol at “South Park: Bigger, Longer, and Uncut” You bastards attacked us Canadians!! Haha, don’t blame us, blame the Mothers Against Canada. I’m a big history fan as well. And for some reason I tend to like old school musicals as opposed to the ones being released today. Yeah, I like some older musicals as well. I try not to watch many of them. Thanks for commenting.